Land area: 2.649 sq. kms. Water area: 0 sq.kms. 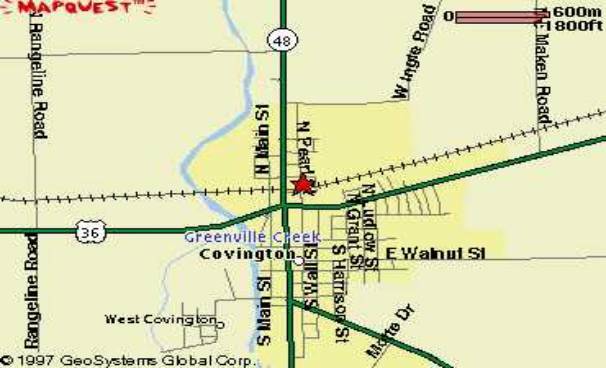 A village in Miami County, West Central Ohio, between Greenville & Piqua, 20 miles North of Dayton, at junction of Stillwater River and Greenville Creek, 73 miles North by East of Cincinatti, South of Lima on U.S. Route 42. Settled 1807 and incorporated 1835 it's main trades are Grain, tobacco, dairy products, livestock, poultry, sawmills. The largest financial concern in the area is The Covington Savings & Loan Association, 117 N.High St who appear in The Million Dollar Directory, 1988. When Mad Anthony Wayne's army marched off to the Indian Wars, one of its campsites was at present-day Covington. The site was called Fort Rowdy, and is the name behind Covington's Annual Fort Rowdy Day festival. In the area's early days, it was the site of Fort Buchanan, a frontier outpost. The Covington armory stands on the site where the fort was originally located. In 1816, Daniel Wright surveyed the area and along with partner Jacob Ullery, made the first steps toward starting a settlement. Those names -- Wright and Ullery -- are familiar to Covington residents today as the names of streets in the vicinity of the original settlement. Covington was known by various names, including "Friendship," "Newberry," and Stillwater." There were just two families living there in 1826. That number increased to 451 in 1850 and 1,791 by 1900. 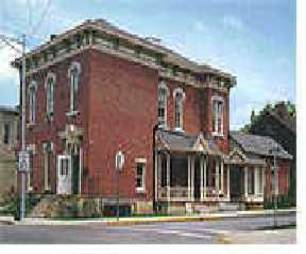 Operated by the Covington-Newberry Historical Society, the Fort Rowdy Museum is located on Spring Street across from the village of Covington's fire station and post office. The building itself dates back to about 1850 and has served many tasks for the town, including a schoolhouse. What you will find inside is an impressive mix of Covington/Newberry Township artifacts. The walls of the downstairs are covered with early photographs that date from the mid 1800s to the mid 1900s. Display cases are full of products and promotional pieces from local merchants and political campaigns. Some of the products represented are, soap, talcum powder, cigars and Rogers drums. In the back of the first floor are tools and parts of early Newberry Township mills, mixed with saws that were used to cut ice out of local ponds in the era before electric refrigeration. There is also a small collection of flower bags from mills in the Covington area that are long gone. On one wall is a painting of Leonard Covington, an officer that served with General "Mad" Anthony Wayne during the Indian wars, and for whom the village of Covington was named after. Not to be missed, the upstairs contains a collection of antique toys and clothes, as well as kitchen items once produced in the Covington and Piqua areas. The museum also has a collection of vintage clothing, including military uniforms that were donated by longtime residents. The Museum is open by appointment and on special occasions - like the Fort Rowdy Days Festival. The Covington-Newberry Historical Society holds an annual Bean Supper Fund Raiser every year in September on the Saturday following Labor Day. "The whole weekend starts off at 10:00a.m. Saturday morning with our Fort Rowdy Gathering Parade - Rep. John Boehner will hold open door sessions in Covington, Oct. 7, 1997"
I am writing in answer to your inquiry about the name Covington; Please accept my apology for taking so long to answer, I will try to be brief, the following is some of what we have in the Fort Rowdy Museum, sponsored by the Covington - Newberry Historical Group. In 1793 Leonard Covington a lieutenant in the Calvary was sent north on the Ohio River from Fort Washington, which is now Cincinnati, Ohio and Covington, Kentucky, to this area where Greenville Creek and the Stillwater River meet and made an encampment on the east side of the river. Here he established Fort Rowdy, named after one of the men who helped to build the fort, It was also rumored that it could have been named after the behavior of the men. A short time later General Wayne and his troops moved in and soon they signed The Treaty of Greenville with the Indians. The town of Greenville where this took place is located about 15 miles from here. Settlers had begun to come to this territory but the first to stay was in 1802-03-04, but as the war of 1812 started, and this section was effected, some of the families moved about 15 miles to the east. They then returned after the treaty was signed and the troops and Indians moved to other areas. The Michael Ingle family was the first to stay. In 1816 David Wright and Aaron Ullery laid out 36 plots and the influx of people was good as three main roads come to this point. These men called the town Friendship and later Oldtown, then Newberry, Trade became quite accessible and many of the people brought special skills and vocations with them like wheelwrights, blacksmiths, weavers, bankers etc. The mail also ran these routes. One of these roads was called the Pikes Peak and Ocean to Ocean highway and now state route 36, going east and west. State route 48 starts at the Ohio River and ends about about 40 miles north of here, running north and south. State route 41 runs from the southeast to route 48, but used to run farther west I believe to Greenville. 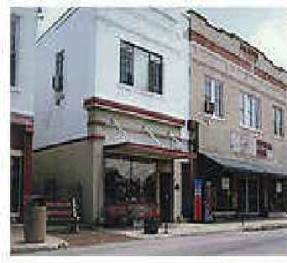 The first post office was named Stillwater, but in 1835 they adapted the name Covington and it is incorporated as such. There were soon woolen mills and grist mills and seven stone quarries. Stone from these quarries were used to form the railroad arches and several small business buildings still in existence today. When these people came they brought with them their faith and desire for education, They started churches and schools even if there were only a few students at first building larger ones as the need arose. We now have a building that house kindergarten through sixth grade, another for 7th and 8th grade and the High School that houses 9th through 12. For the 11th and 12th grade they can choose to stay at the home school and take subjects to help them enter college or they can go to a Joint Vocational School located about six miles away in Piqua to learn a trade and work part time as they learn. 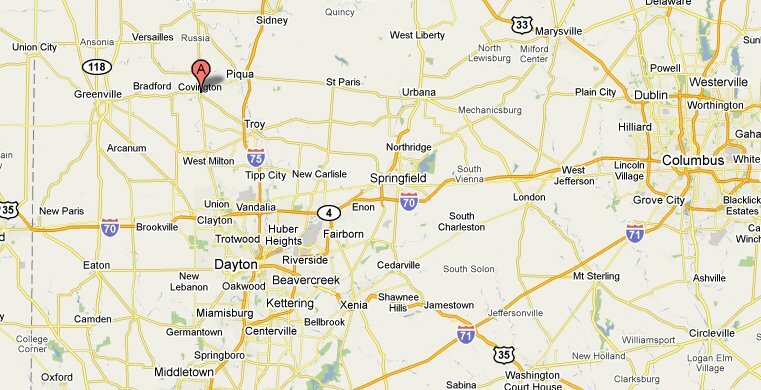 There is also off campus branches of Wright State and Edison State Universities located in Piqua, We have a Church of the Brethren and three branches of it, a Grace Brethren, Lutheran, Presbyterian, United Church of Christ, Catholic and old German Baptist. One of the branches of the Brethren has their own school. Since 1895 there has been a women's Literary Club, Other clubs are Avocation, Grandmothers, and 2 garden clubs. Other organizations include Oddfellow and Rebeccas, Masonic, Eastern Star, Eagles, Kiwanis, and Optimist. Service organizations include American Legion, Amvets and Veterans of Foreign Wars. There is a Ministerial Association that helps the needy on a short term basis. The town’s slogan is "In Covington We Care"
These are the more important things I can think of at this time. The name of General Covington had remained in obscurity as far as the local people were concerned but in 1988 a movement began to erect a memorial for General Pike but not for Covington although a marker was placed for him and 11 other notable officers. In 1989 one of the historians was to try to have a memorial placed by Pikes. Another letter in 1988 from a Historical Society in Prince Georges County, Maryland stated that on April 23, 1989, The Prince Georges County Hall of Fame would induct General Covington as a member at the St. Georges Day Dinner, Riverdale, Maryland. Hope this may help you in some small way.